I admit that I am influenced by book titles in my choice of books to read. In that sense, Letter to My Daughter was somewhat off putting for me. I was expecting a somewhat predictable story of a mother writing a letter to her daughter. Fortunately, I overcame my reticence, and upon reading the first couple of paragraphs I found myself immersed in a riveting story. The novel begins in present day Baton Rouge, Louisiana; a mother (Laura) has started writing a letter to her daughter Elizabeth to alleviate her anxiety and worry. Her teenage daughter has just left the house after yet another argument with her mother In her letter, Laura has decided to tell her daughter about her own troubled adolescent years and share secrets about her past she had previously been unable to confide. As we read Laura's letter, we travel back in time to the late '60s. Laura’s parents are conservative Southern Baptists who don’t approve of her relationship with Tim, a Cajun boy from the other side of town. 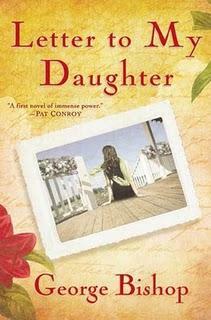 Laura continues to see Tim against her parents wishes until one fateful day when Laura’s life is changed irrevocably. At the risk of giving too much of the plot away, the novel touches on themes of prejudice, young love and sexuality, the Vietnam War, mother-daughter relationships, and the challenges of being both a teenager and a parent in an increasingly complex world. You don’t have to be a parent or a teenager to relate to this story. Once I started reading Letter to My Daughter, I found it difficult to put it down and ended up reading it in just two sittings. Don’t be put off by the title of this book as I was; the author has created an unforgettable story that will stay with you for days after you turn the last page.